Let me tell you about the saga hero Kári Sölmundarson and why he is included on my altar. Hero/ancestor worship below. Kári Sölmundarson is a figure from Njál’s Saga, who, like many saga heroes, may or may not have been a real person. The first time we see him, he is standing next to the mast of a ship leading a convoy, and he is wearing a silk tunic and a gilded helmet, carrying a gold-inlaid spear in his hand. He is the very picture of the warrior ideal of the time: fair-haired, wealthy, leading several ships. More important than his appearance and standing, however, are his actions, and throughout the course of the saga, they are ever honourable and impressive. The first thing he does is help out Njál’s sons when they are in a spot of bother with other Vikings, and this is without having met them before; they swap introductions and he just decides to help them. Cool guy. On top of all this, he’s a badass warrior. When we first meet him, he makes “a backward leap over a boom which lay across the ship” and cuts off a man’s arm just by swinging hard. Then someone throws a spear at Kári, but he dodges it by jumping. And this is just when we meet him. After this he joins the Njálssons on their adventures and becomes part of the family by marrying Njál’s daughter. I won’t run through everything he does, but I will list his virtues: steadfast, reliable, excellent at fighting, persevering, humourous even in dark times, loyal, loving, badass, and at all times honourable. When Njál’s family, including Kári’s son, is SPOILER slaughtered, Kári vows revenge on their killers. Slowly, he kills almost all of them over the course of years, mostly on his own. When he gets down to the main antagonist, he decides not to kill him, and instead makes peace with him. What this shows is a man fiercely given to justice, but also to forgiveness. Below is the essay I wrote for my university subject in Semantics (linguistics) on the semantic structure of kennings. I’ve decided not to dissect it, since it’s just too convoluted to do that and have it make sense, so here it is in its entirety. Linguistic jargon will be explained in footnotes below. This is my essay and if you share it, I prefer you link to this page. In any case, please credit me (Katla Hrútsvinr). Kennings are circumlocutions used to refer to nouns. They are found in old Germanic poetry, particularly from the Middle Ages. They use colourful and often metaphorical language to describe their referents* without naming them directly. Kennings are a defining characteristic of Germanic poetic oral tradition, found in abundance in Old Norse (ON) texts, and have been subjected to decades of study. The subtle semantic structure of these circumlocutions, however, has rarely been examined in great detail. It is noted, however, that for our purposes there is a distinction between kennings that are simply descriptive periphrasis and kennings that incorporate a metaphor. This paper will deal solely with metaphorical kennings, referring to them simply as ‘kennings’. Syntactically, kennings are structured in at least two components: a base-word in whatever case the surrounding verse requires, and a determinant either in the genitive or as the first part of a compound, if the kenning is a compound (Holland, 2005). Semantically, kennings are composed of a metaphor (the base-word) and what is usually a metonym* (the determinant). A kenning is essentially a complex semantic blend of metaphor and metonymy (Holland, 2005:4; Broz, 2011:10). Fidjestøl (1997, in Holland, 2005:5) provides a six-part definition of kennings, mentioning that neither base-word nor determinant are synonyms for the referent, and that there are a certain number of regular target domains*; that is, most kennings seem to refer to a select few domains, the largest body being battle and things related to battle, for example warriors, weapons, the bodies of the dead, and so on. They have a specifically ornamental use within poetry (Holland, 2005), and are unique to Germanic texts. Kennings are limited by the context around them, since they appear in verse, which has stress and syllable requirements. Whatever the syntactic structure of a kenning, it is the semantic structure, which is ‘formulaic’ as Holland (2005) argues, that is of interest. The main question is that of discovering how kennings are mentally deconstructed and determining the best way to semantically analyse them using an existing theory. Kennings will be broken down and analysed using aspects of Conceptual Metaphor Theory, then treated with Conceptual Blending Theory and a modification thereof. Given the massive corpus of existing kennings, the examples used here will all be selected from Njál’s Saga, an Icelandic saga written in the late thirteenth century by an unknown author. Examples are given in English using the translation by Cook (2001), and the corpus is listed in Appendix I. The base-word element of a kenning, web in (2) or forts in (1), is the element drawn from a source domain, and has no inherent semantic similarity to the referent; the base-word is the metaphor. It is only through the determinant (often a metonym) that a connection can be drawn between the source domain and the referent, and thus the whole metaphor understood. The determinant itself may have little or no inherent semantic connection to the base-word, as with (1), where brains is the determinant. For this kenning to be understood, forts must in some aspect resemble its referent. Forts are protective surrounds; they are defensive and solid. The forts of brains, then, is something that surrounds and protects brains, rather like a fort that surrounds and protects its garrison. Forts of brains means simply ‘skull’. Web of spears is a very clear case of a combined metaphor and metonym: the base-word metaphor web brings to mind a connected, interlocking pattern, and the determinant spears is a part-for-the-whole metonym for warriors, whose main weapon at the start of battle would have been a spear. The kenning itself means ‘battle’, conjuring the image of warriors who are organised like a web. Conceptual metaphor theory (CMT), which seeks to indicate the metaphorical concepts used in everyday language (Lakoff and Johnsen, 2003), is not well-suited to the task of semantically analysing the very specific scope of kennings. First, kennings are used only in a poetic context, not in vernacular language, and as such have a very limited, specialised range of use. Most importantly, kennings are used to refer to concrete entities instead of abstract concepts that require mapping to be understood, and thus have a very different function; in Birgisson’s words, “The general aim of the kenning-system could thus be said to make the concrete unusual rather than the abstract concrete” (2012:286). The usefulness of CMT here is limited to the idea of a culturally salient conceptual metaphor and its various linguistic expressions. Kennings and the metaphorical concepts behind them seem to function in a similar way to these ideas in CMT (Birgisson, 2012), and the theory is useful in examining those kennings which are conventionally established in literature. I will emulate Lakoff and Johnsen’s (2003) format for these. There are many kenning relationships which existed conventionally and culturally and whose referents would have been identifiable without interpretation, similar but distinct from Lakoff and Johnsen’s idea of the ‘conceptual metaphor’. Birgisson calls these metaphorical concepts in ON poetry ‘kenning-models’, of which the kennings themselves (‘kenning-variants’) are linguistic expressions (Birgisson, 2012:285). These concepts will be hereafter referred to following Broz’s lead. An example of this is PEOPLE ARE TREES. This idea surely existed as a kenning-model in medieval Scandinavian culture, evidenced not least by its presence in recorded mythology – the first humans were created from logs and named ‘Ash’ and ‘Elm’ (Sturluson). Three kennings in the included corpus draw upon this kenning-model: sword-trees, woods of the sword, and alder’s sweat. Sword-trees links the metaphorical tree to sword, which is a metonym for ‘warrior’. This determinant serves as a characteristic of the base-word; that is, the base-word has the characteristic of wielding a sword. The image of a tree wielding a sword is nonsensical, but with the kenning-model PEOPLE ARE TREES, the kenning simply means ‘person who wields a sword’ = ‘warrior’. The kenning woods of the sword has the same mapping*, but expands on the image metaphor with a group of warriors, closely packed together as trees in the woods are closely packed together. Alder’s sweat, a reference to smoke from burning wood, hinges on the shared concept of something created through exposure to heat – the metaphor here is to sweat of the skin. The ‘sweat’ which is given off by an alder tree when exposed to heat (fire in this case) is smoke. Alder is a metonym for trees in general. By analogy, the tree is a person; smoke is to a tree what sweat is to a person. When compared, the kennings display both sides of the relationship; humans and human characteristics may be referred to by way of tree metaphors, and trees and tree-related concepts may be referred to by way of human metaphors. 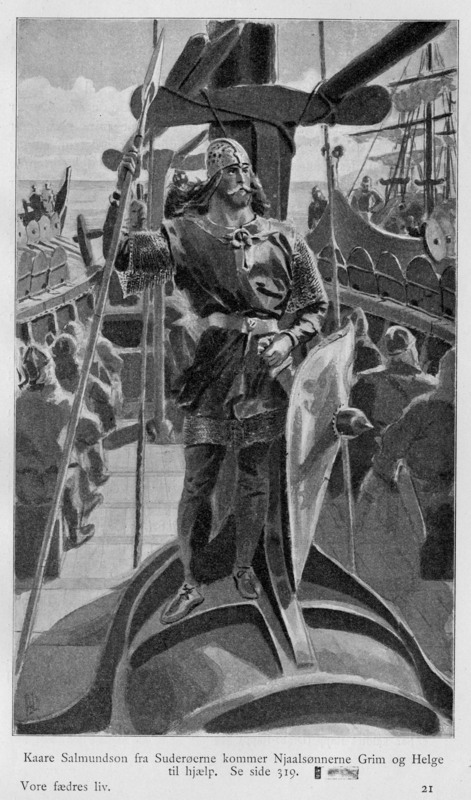 Other examples of cultural conceptual metaphors commonly found in poetry are GOLD IS FIRE, WARRIORS ARE DEITIES (Ull of the elm-string; Baldr of weapons; Ygg of armour), and SHIPS ARE ANIMALS (sea’s elk; sea-steed; sea’s horse; Gylfi’s reindeer). Such kenning-models are important and are often essential in understanding kennings, as will be shown later. It is possible that kennings are better treated with Conceptual Blending Theory (BT), put forth by Fauconnier and Turner in 1998. BT involves a more complex schema for metaphor, acknowledging spontaneous and novel metaphorical constructions, in contrast with the established vernacular metaphorical concepts of CMT (Grady, et. al., 2004). BT has four mental spaces in contrast with the two domains of CMT. Two of these mental spaces are input spaces, easily understood as the source and target domains of CMT (Grady, et. al., 2004); the third space is the generic space, where lie the concepts shared by the two inputs; the last space is the blended space where the shared concepts combine to create the metaphor (Broz, 2011). As is easily discovered upon attempting, and corroborated by Broz (2011), examining kennings with BT is problematic, not least because of the difficulty in determining a generic space. Kennings do not contain their referent, unlike the metaphors usually analysed with BT (e.g. Her husband is a pig, where husband is the referent), which means that the regular input spaces need to be different. In addition, with kennings, the blended space is not synonymous with the metaphor construction, as is usually the case with regular metaphors. The blended space therefore requires more processing. Broz modified BT to make it more suitable for kennings, and found some small success, but still found it lacking in precision. With BT in mind, we return to Holland’s view of kennings as “a blend of metaphor (on the base-word level) and metonymy (on the determinant level)” (2005:4). We want to understand or represent how this specific formula combines the ideas and how they interact. The elk metaphor only makes sense when the metonym is present. Elk has no connection with its referent ‘ship’. Sea’s elk brings the metaphor into being all at once, with the essential help of the metonym. In the examples in this corpus, a kenning is nothing without both the metonym and the metaphor, and requires a sophisticated interaction between them, as well as much conceptual manoeuvring. Imagery is essential to understand most kennings. The image inputs of the base-word and its determinant are imagined together in any number of iterations until an image is found that is most viable. Often the surrounding verse provides context to make this easier. The image is built from the ground up, becoming more and more refined as the listener makes decisions about what is a likely interpretation, and what parts of the images are relevant for understanding the kenning. The listener may make mistakes in this imagining, taking a wrong turn and only realising it a few steps later. The listener either makes the necessary steps to arrive at the kenning’s subject, or fails entirely. Conventional kenning-models, such as SHIPS ARE ANIMALS, often help the listener make the final leap, but when these do not exist, the listener must draw upon their cultural knowledge or become creative and more abstract in their imaginings. Blending processes “frequently involve the use of mental imagery and mental simulation” (Oakley and Coulson, 2005:5), thus making BT useful once again for kennings. BT has names for the various processes (after Grady et. al., 2004, and Fauconnier and Turner, 1998): composition is the first, where elements of the two inputs are projected together into one space, creating a sometimes-unrealistic image. Completion is the second, where independent knowledge fills out the image, creating a more plausible scene using relevant elements of either input. Elaboration is the last process, where the blended image and resultant metaphor may be extended and further mappings made indefinitely. The interpretation of kennings is especially heavy on the Composition side. It is not in fact a simple step to combine the two inputs; a kenning’s base-word and determinant have to go through the aforementioned cognitive manoeuvring to achieve even a generic space. It seems that the base-word of the kenning is the starting point, the underlying foundational image of the kenning upon which all further interpretive decisions are made. We start with elk. Elks exist in all sorts of contexts: foraging in the forest, being hunted, mating in the springtime; but the kenning’s determinant tells us that we are to consider an elk in the context of the sea. The sea is not an elk’s usual habitat, and we have to build an image, however unlikely, of an elk doing various things in the sea. An elk might drown. It might also swim. In a flight of fancy, we can imagine an elk running across the surface of the water. With no other determinants to help us, we are forced to use our imagination to continue. These various scenarios involve the elk under, in, or on the water. We imagine how the elk might move: flailing rather inelegantly, paddling, or galloping. Flailing seems the least likely in a poetic context, and paddling similarly so. Galloping across the waves is physically impossible, but also more poetically favoured because of the striking imagery. In our modified blending theory, we have arrived at Composition, with the important distinction that the referent of the metaphorical construct is still opaque, unlike regular BT. At this point we must either take further steps to cultivate our image, or discard it entirely. An elk galloping across the sea must bring to mind other associations, and we need to think abstractly. This is the largest and most complex step. We need to evaluate salient elements of our sea-elk image, and match them up with concepts that have comparable elements. In keeping with the visual aspect of kenning interpretation, the sea-elk has two salient visual points: the back and forth movement across the waves, and the prominent head of the animal. This loosely corresponds with the Completion stage. A match for both of these elements is a ship, which bucks across the waves and has a prominent prow, often, in medieval Scandinavia, carved to resemble the face of an animal. We have made the final leap from blended space to complete kenning with the help of association and cultural knowledge. An audience additionally equipped with the kenning-model SHIPS ARE ANIMALS would have had to make a smaller cognitive leap. What if we had followed the underwater elk line of thought? Who is to say that the kenning did not refer, in fact, to a whale, or some other sea-going animal that moved back and forth? Perhaps we could have imagined an elk galloping underwater. The answer is that this is a possibility, given the vast imagination of skalds and their creative kenning images. I would debate, however, the appropriateness of substituting an elk for a whale: in how many salient aspects are they really alike? Elk as ship is more sensible than elk as whale. This intuition depends on the listener, but is less problematic than at first sight, since the intended audience would have had the necessary cultural background to arrive at this conclusion. The context of the kenning is of help, as well, since sea’s elk appears in the whole phrase men who mount the sea’s elk, referring to sailors. This additional mapping of sailors on a ship to men riding an elk is an example of Elaboration. In the analysis of metaphorical kennings, I propose a BT with modified mental spaces and cognitive steps. The mental spaces, as modelled by Broz, are two inputs, consisting of the two elements of the kenning but importantly not the referent itself, the generic space, where they are imagined together, and the blended space, where the kenning-model assists with the identification and completion of the metaphorical relationship. The cognitive steps differ widely. Composition, in the new kenning-BT, is the synthesis of the two inputs into an image, however unrealistic. Any metonymical relationships must be deciphered before they can be synthesised with the base-word. This stage may require cognitive decisions and leaps, with possible backtracking and abstractions to create a viable image. Completion in the new kenning-BT is when salient points of the already synthesised generic space are evaluated and chosen for matching to a suitable entity. I propose a new stage after Completion, Conversion, when the referent of the metaphor base-word is found by having its salient points matched with those of the generic space. After Conversion comes the optional Elaboration, where the kenning-model can be expanded upon and further mappings made. This Blending Theory, modified for use with metaphorical kennings, can be applied to all other metaphorical examples in the corpus, and possibly further examples as well. Kennings are semantically complicated circumlocutions that have often been overlooked despite their uniqueness. They are difficult to analyse as a whole. Conceptual Metaphor Theory is inadequate for kennings because it specifically looks at understanding abstract, linguistically entrenched concepts with metaphor, as opposed to simply descriptive, stylistic metaphor used for poetry. Conceptual Blending Theory, while more nuanced, is also largely inappropriate for kennings, because of its vagueness in defining how a generic space is constructed, and because its input spaces do not match the components of a kenning. However, with some modification, BT can be made more appropriate to deconstruct kennings. I have described in short a modified BT specifically for metaphorical kennings (importantly excluding non-metaphorical kennings). Overall, kennings are understood with a layered imagery process, with each cognitive step relying on the previous steps, the final leap of metaphor aided by cultural knowledge and existing kenning-models. Ideally, an original theory for analysing kennings would be able to break down these cognitive steps with greater granularity, but such a theory is beyond the scope of this paper. Appendix I. The corpus of examples, drawn from Njál’s Saga (Cook, 2001), shown in bold either with entire or partial verse, or alone, with verse number. Not all examples are referred to in the paper. in his smithy of prayers. on the anvil of Veturlidi’s head. who craved shields set with rings. has dwelt in my mind. Birgisson, B. (2012) ‘Skaldic Blends out of Joint’ Metaphor and Symbol 27: 283-298. Broz, V. (2011) ‘Kennings as Blends and Prisms’ Jezikoslovlje 12.2: 165-186. Coulson, S. and Oakley, T. (2005) ‘Blending and coded meaning’ Journal of Pragmatics 37:1510-1536. Fauconnier, G., and Turner, M. ‘Conceptual Integration Networks’ Cognitive Science 22.2: 133-187. Faulkes, A. (1998) introduction to Snorri Sturluson’s Edda. Exeter: Short Run Press Limited. Holland, G. (2005) ‘Kennings, metaphors, and semantic formulae in Norse dróttkvoett’ Arkiv för Nordisk Filologi 120:123-147. Lakoff, G. and Johnson, M. (2003) Metaphors We Live By. London: University of Chicago Press. Sturluson, S. Prose Edda, translated by Byock, J. (2005) Great Britain: Penguin Books. Unknown author. Njal’s Saga, translated by Cook, R. (2001) London: Penguin Books. *referent: the thing you’re talking about. When I say “my bed”, my actual bed is the referent of the phrase “my bed”. Unsurprisingly. *genitives: possessive constructions, as in Bob’s car, where Bob’s is the genitive. *metonym: metonymy is when an object or entity is referred to by a different word that is associated in meaning. For example, “Canberra” is a metonym for the Australian government, and “Hollywood” is a metonym for the American film industry. *target and source domains: when using a metaphor, the target domain is the thing you’re trying to describe. The source domain is the thing you’re using to describe it. If I’m trying to describe my cat to you, I might say he yawns like a velociraptor and goes down on his food like a dinosaur ripping apart its prey.